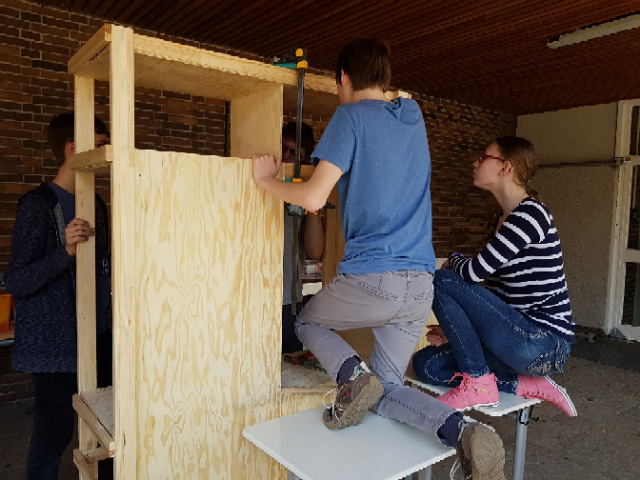 Too many students in rooms which are too small, inflexible classrooms, and no secluded spaces for individual work: Students of the 9th grade at the Europäisches Gymnasium Bertha-von-Suttner wanted to change something about this situation. In particular, they called for a creative space for art lessons with mobile spatial solutions and a pool of materials. Together with raumlabor they developed “The Workbench of the Future”—an innovative, sustainable, and ergonomic piece of furniture enabling one to work flexibly: height adjustable, suitable for use inside and outside, and equipped with various tools. Organized into different groups—from infodesign and the construction group to the editorial team—they carried out all the steps in the process, from research into innovative upcycling ideas through to the practical realization and documentation. raumlabor is a collective network structure composed of eight architects. Based in Berlin, they have worked at the interface between architecture, urban planning, art, and intervention since 1999. In their work they address issues of space, the city, and urban development as a cultural project and process. Their field of experiment are the spaces which have been abandoned or are caught between systems, time periods, or planning ideologies. raumlabor activates the unused potential of these sites, thus opening up new perspectives for alternative patterns of use, a common culture, urban diversity, and difference.